I want to order a Nextion display so i can use it on my BBQ controller. My question is does this plugin also works with the improved nextion display?? My question is does this plugin also works with the improved nextion display?? I have confirmed compatibility with the enhanced version. My evaluation used a NX4024K032-011. how do I sent commands to the nextion now? but that no longer is the case, how do i do this now? ***Edit*** it's the name of the task now, in my case "lr"
You guys could make a note of that? I tested the latest version (mega-20181207) and no issues were observed. to take advantage of H/W serial using the pin swap option it needs to be wired like this, correct? If this is ok then the scheme is on https://www.letscontrolit.com/wiki/inde ... le=Nextion is not good. 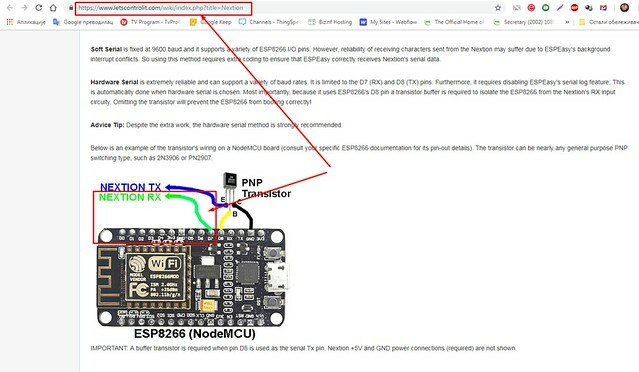 This scheme shows that D7 (RXD2) na Nodemcu connected with NEXTION RX. @homerruma: Thank you for reporting the error. The image has been corrected. 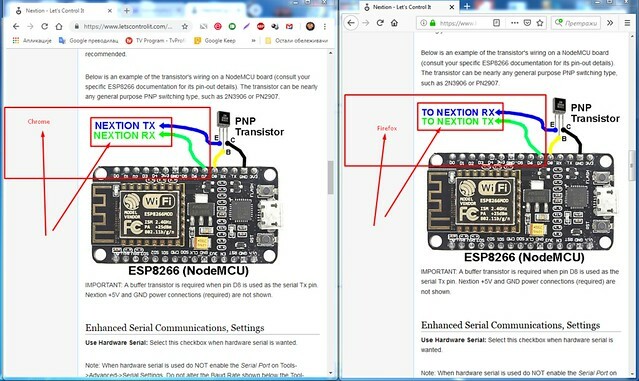 @wiki: Nextion and ESP8266 are indeed 3.3V devices. But the transistor is not intended to convert the logic level. It is a buffer that is used to ensure that the ESP8266 can boot-up. Without it there is a strong chance the ESP8266 will hang on a reset. As I see on the link https://www.letscontrolit.com/wiki/inde ... le=Nextion the image is not corrected. Still stands RX Nodemcu at RX Nektion. ....But the transistor is not intended to convert the logic level. It is a buffer that is used to ensure that the ESP8266 can boot-up. Without it there is a strong chance the ESP8266 will hang on a reset. Oh yes, you are right, now I remember. Hmm, I see the correct drawing in my browser. Try refreshing your browser cache to regenerate the Nextion Wiki page. Usually the F5 key will do a refresh (works in FireFox). A refresh should populate the recently uploaded image. I've refreshed the page. Now I closed it and reopened it, I can not see the changes. Ask the third party to confirm. Hopefully someone in the audience can confirm the wiki page has the new drawing. I retested the Nextion wiki page using three different WIN10 PC workstations. And I viewed the page using FF, Edge, IE, and chrome browsers. They all show the latest image. You will see two images in the file history. The original (depreciated) July-30-2018 and the corrected image from today, Jan-10-2019. The corrected image is the one that is targeted by the Nextion Wiki page. If you don't see both images then that would indicate that there is a wiki server cache issue; Check again in a few hours. To refresh chrome's cache you should hold Ctrl and press F5. Hi! 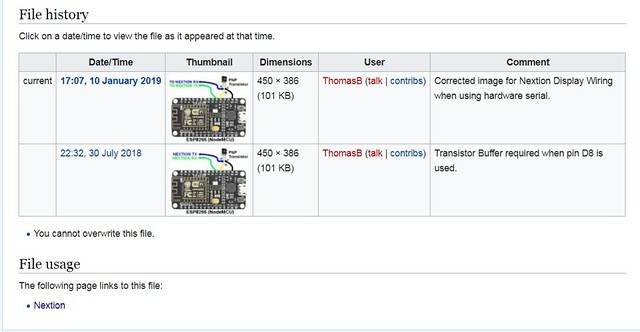 I understand that I may not be in the subject, but I would advise you to use the serial to ethernet connector https://www.eltima.com/products/serial-over-ethernet/ program, since It will be more formatted and better. During the data transfer period, you will receive a full signaling branch.